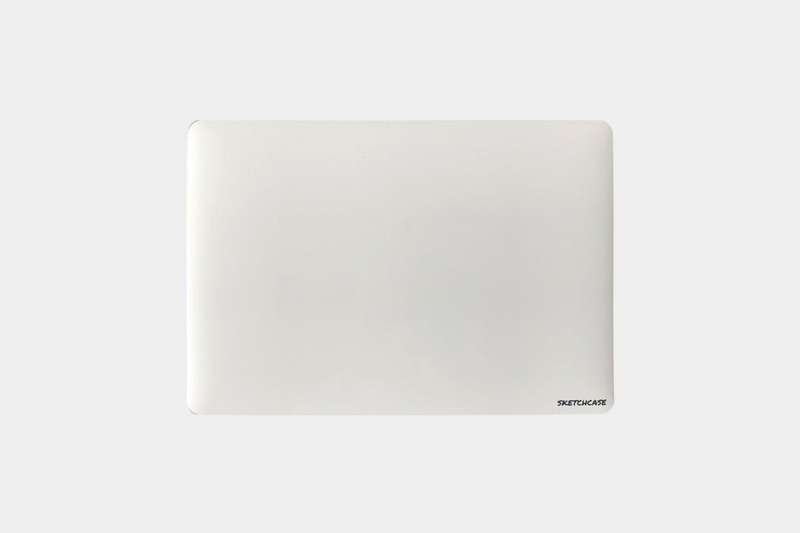 The Sketchcase is an awesome tool that turns your laptop into a portable whiteboard. Useful, right? We thought so too – especially if you’re a whiteboard fan and on the go a lot. If you really hate whiteboards—maybe you’re more into chalkboards?—you may want to skip this review. It’s nice when folks think of things that were not travel-friendly before and make them travel-friendly. 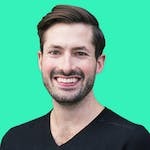 When we’ve needed a whiteboard on the road, we’ve usually rented out an Breather or a room in a co-working space, or resorted to carrying around a large notebook or a stack of computer paper, even going as far as to use some chalk marker on a set of windows in an Airbnb. While the brand name implies a case, it should be noted that this is just a sticker. If you order this thinking it will protect your laptop; you will be disappointed. It may help protect your computer against some small scratches, but that is not its intended use. Maybe one day they will make an actual case—but for now, we are relegated to a simple sticker. 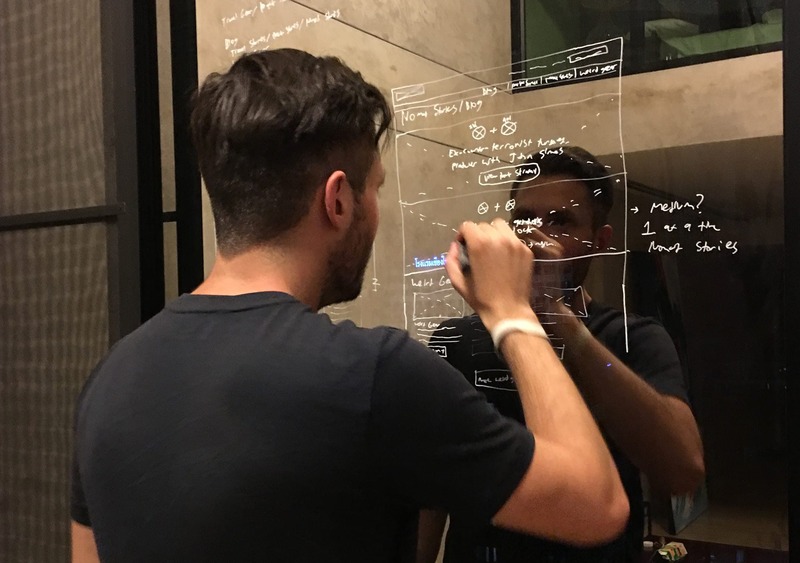 The Sketchcase is a pretty simple concept—it takes up the entire outer surface of your laptop (the back of the screen) and allows you to write on it with a dry-erase marker, like any whiteboard. This is a great tool for anyone who is on-the-go but still wants the ease-of-use and efficiency that a whiteboard can offer. We’ve found that whiteboards are a great way to explain concepts quickly. It’s faster than paper, and you can quickly erase it—it just lets you get ideas down quickly in a physical setting. The Sketchcase also cuts down on the need to lug around notebooks while traveling. Now, by no means is this thing limited to strictly business settings. You could use it to draw some cool designs and change up the look of your laptop. Throw on some free advertising for your company. Maybe you want to let your kid draw all over it. Or maybe you want to crack your coworkers up during a meeting with some inappropriate drawings—we don’t judge. By all means, feel free to use it however you see fit. Out of the box, the Sketchcase looks like any old sticker. It’s got a paper back that you peel off to apply. We’ll go over the steps for applying here, but for an in-depth look check out our video review. The first step is to clean the front of your laptop. 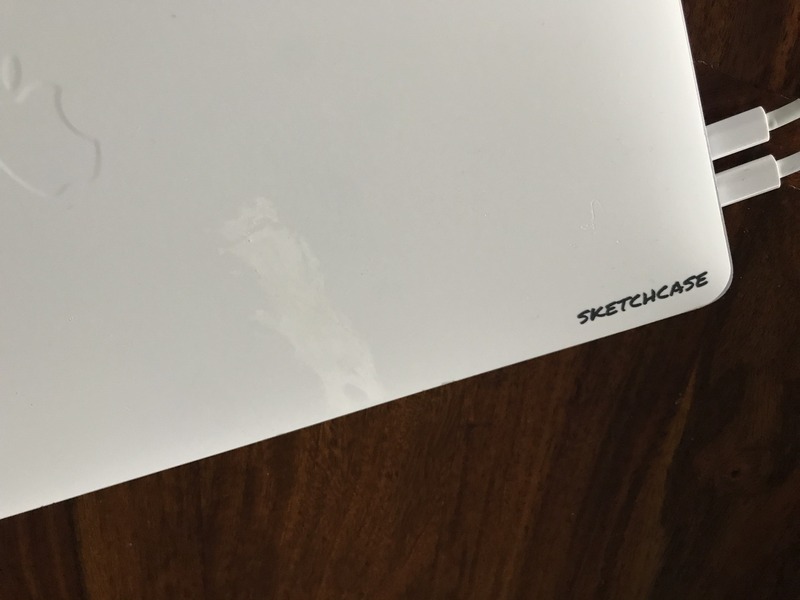 The folks at Sketchcase include a cleaning wipe with the sticker, which is super convenient. Just use that to clean off your laptop so you can get the best adhesion possible. Applying the sticker is actually a lot easier than we anticipated. The Sketchcase uses this 3M technology that lets you slide it around a bit as long as you don’t put pressure on it. So once you get the sticker ready, just line it up with the corners and make sure everything is perfectly aligned—without pressing down on it! We gave one of our stickers a one week test and pulled it off after. No stickiness or residue was left on the laptop at all, which was surprising. Oh, and you’re going to want the Sketchcase logo on the bottom right of the laptop when it is open… So… Bottom left when it’s closed. No, wait—top left. You know what? Just look at the picture. Once everything looks good, go ahead and press down in the middle. We used a credit card to secure the rest of the sticker and get all the air bubbles out—starting in the middle and pushing towards the corners to make sure they are lined up properly. Protip: Wrap the credit card in a paper towel so you don’t scratch anything. Smooth everything out with the credit card, and you should be good to go! It really isn’t as stressful as you would think—we promise. Congratulations, you now have a whiteboard on your laptop! The Sketchcase does come with a dry-erase marker, although it’s not the best—it’s one of those cheap, no-name markers with the eraser on the tip. Oddly enough, the folks at Sketchcase don’t even seem to like it—they recommend you use EXPO markers, and we agree. 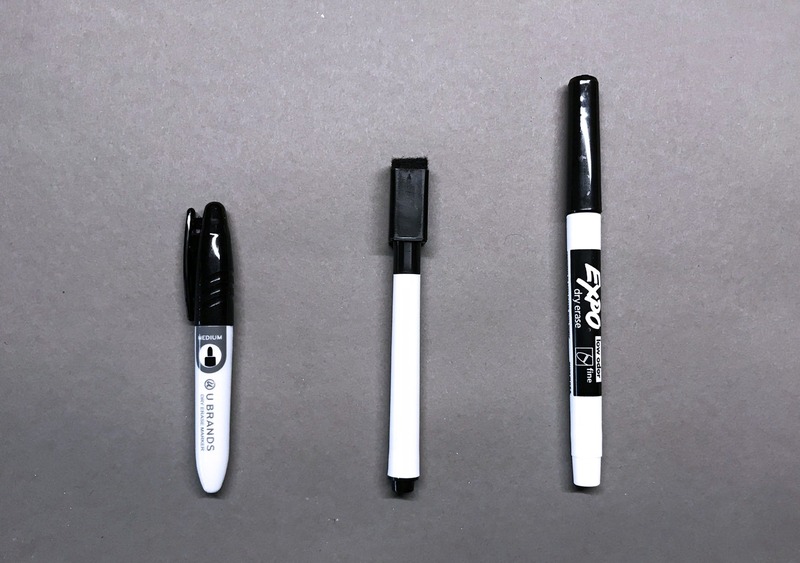 We’ve also been using some small markers from U Brands which, size-wise, are awesome for traveling, but we’ve tested and used them with mixed results. Sketchcase recommends the EXPO Low-odor Dry Erase Chisel Tip and Ultra Fine Tip markers. You’ve probably seen them before—nothing crazy, but they’re reliable and they’ll get the job done—there’s a reason this brand shows up in every meeting room and classroom—the quality and longevity is there. We haven’t personally tested permanent markers, but the folks at Sketchcase say you can use them. You can use rubbing alcohol to erase, or write over the permanent marker with dry-erase and wipe it off like normal. As far as durability goes, we don’t have any complaints yet. At the time of this review, we’ve been using it for about two weeks—taking it in and out of bags pretty frequently—and had no issues. We’ve also left whiteboard marker on it for 48 hours before erasing, and it came off perfectly. Time will tell if the sticker stays on after some extended use—we’ve only tested it for two weeks. We’re curious to see if there will be any dirt build-up as the Sketchcase gets some continued use. The edges of the sticker seem to be secured pretty well, but after a few months of pulling it in and out of a bag there may be some peeling. We’ll keep the usage timeline updated below. At the time of this review, the Sketchcase is priced at $25 and will be available for $15 with the early-bird discount on Kickstarter. All in all, a pretty good deal considering the amount of functionality it can offer. Applying the sticker was a breeze, works well out of the box. Some of the whiteboard enamel has scratched off over time. The Sketchcase is a nice addition to your laptop and can come in handy for a variety of purposes. Whether it’s strictly for business or just to doodle—having a whiteboard on hand is pretty convenient. The Sketchcase seems to hold up well, and for the price point we have no complaints.